President Moon Jae-in on Friday named seven new ministers in a move to set his administration up for the second half of his term that will also replace the country's point man on North Korea. Kim Yeon-chul, currently the head of the Korea Institute for National Unification, has been tapped as the new unification minister, the presidential office Cheong Wa Dae said. Kim, 55, will replace Cho Myoung-gyon. "Unification Minister nominee Kim holds great expertise and knowledge in inter-Korean economic cooperation and the North Korean nuclear issue as one of the few experts in inter-Korean relations with vast experience in both academics and the field," Cheong Wa Dae spokesman Kim Eui-kyeom told a press briefing. "He is the right person to realize the New Korean Peninsula Regime aimed at building a joint community of peace and cooperation by pushing for the speedy implementation of inter-Korean declarations," the spokesman added. Cho Dong-ho, a professor from Korea Advanced Institute of Science and Technology, was tapped to replace You Young-min as science minister, while Park Yang-woo, a professor from Seoul's Chung-Ang University, was nominated to become the country's new minister of culture, sports and tourism, replacing Do Jong-hwan. The Cabinet reshuffle partly comes as four lawmaker-turned-ministers, including Do, are expected to run in the National Assembly elections to be held next year. 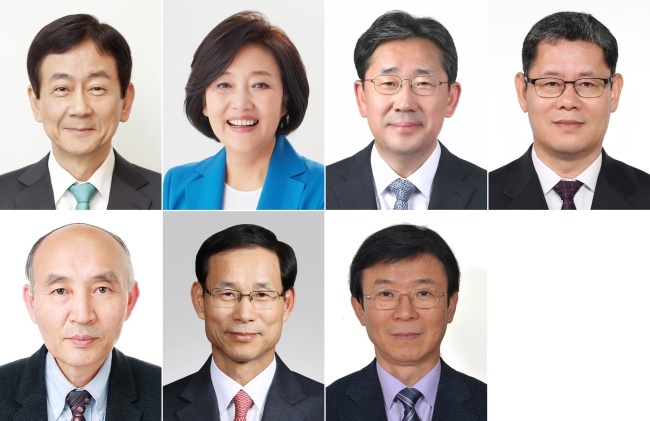 They also include Land and Transportation Minister Kim Hyun-mee and Oceans Minister Kim Young-choon, who will be replaced by Choi Jeong-ho, a former vice minister for transportation, and Moon Seong-hyeok, a professor from World Maritime University. Interior and Security Minister Kim Boo-kyum, also a lawmaker of the ruling Democratic Party, is set to be replaced by another DP lawmaker, Chin Young, according to Cheong Wa Dae. Lawmakers are not required to relinquish their parliamentary seats when appointed to a government post but are prohibited from running in elections while serving in the government. Chin, even if appointed, may still run in next year's election as long as he quits his ministerial job soon enough. The latest reshuffle will see one more lawmaker appointed as a government minister.